The Bohne Foundation is dedicated to feeding the hungry, clothing the naked, comforting the destitute, encouraging the hopeless, while aiding the neediest members of our global community. For over six years, we have donated Christmas presents to more than one hundred orphans at the SOS Family Village in Lockport, Illinois. This year on Saturday, October 12th, we began Christmas a little early by donating over 84 bicycles to all of the children ranging from ages 1-19. Our desire has been to give these kids those life experiences that others in their situation would never get, like the memory of your first bike. We extend a special thank you to Citgo and Richard’s Bicycle Shop in Palos Heights for their generous hearts. Citgo donated all of the helmets for the children and came out to fit each child with the appropriate size helmet. 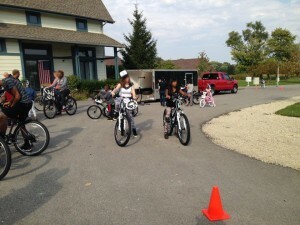 We purchased the bicycles at Richard’s Bicycles in Palos Heights who gave up their morning and brought their whole staff out to fit every child to their new bike. 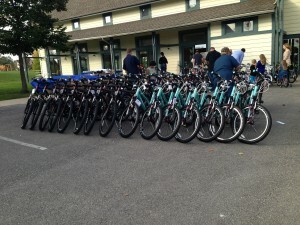 It was Bicycle heaven as the kids lined up bright and early. First stop was for their helmet, then signing a commitment to take care of their bike, receiving a sticker with their name to place on their bicycle and then off to pick and be fitted for their NEW bike! What an amazing site to see all of these children filled with joy and excitement as they rode their bikes through the village. Visit our Flickr and Facebook pages to see some of the pictures. The SOS Village was overwhelmed by the generosity of so many. It’s through donations like these the village staff is better able to offer across-the-board, quality services to children and families.We plan on joining them again for their Halloween party, Thanksgiving and this Christmas. It is a tremendous joy to make a difference [even for a day] in the lives of these young men and women. You should see their eyes light up as they receive their gifts. For that moment, they don’t feel less than, and that is priceless!